In this cartoon Pluto inexplicably lives in a lodge in the mountains. Here he receives a package that jumps. It shows to contain a little turtle. Pluto has a hard time delivering the mail and the turtle in his original package, but in the end it’s the turtle which delivers the letters. This sweet and slow cartoon is the third starring the cute little turtle from ‘Canine Patrol‘ (1945) and ‘Pluto’s Housewarming‘ (1947). It uses the Pluto-befriends-a-little-animal-story formula of Pluto first being hostile to this new animal, then becoming friends, and it has a distinct routine feel to it. Clearly, this story formula was running out of steam badly. 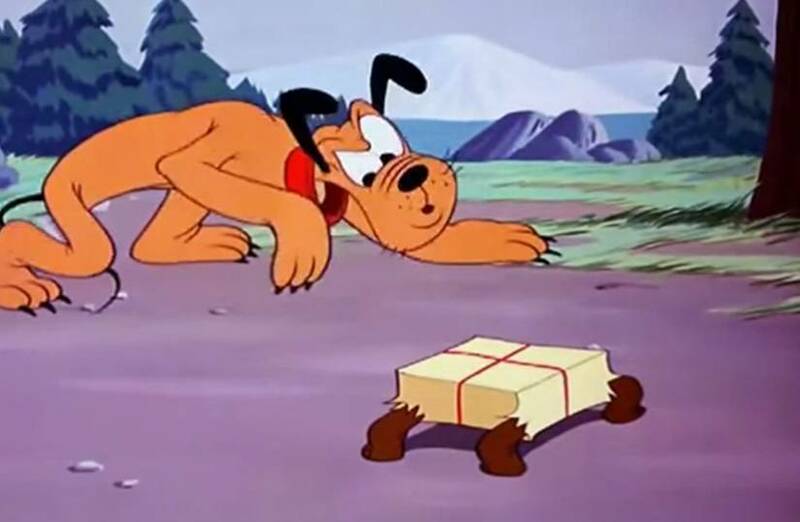 Luckily, ‘Pluto’s Surprise Package’ was the last Pluto cartoon using it. This short’s best scene is when Pluto tries to retain three letters and the little turtle inside its package, troubled by wind and the turtle’s constant urge to move.